Even though it's still just July, I recently received a copy of Country Sampler Magazine's September issue! It's a reminder to all that fall and Halloween are just around the corner. I started flipping through the pages and came across a trio of familiar faces. 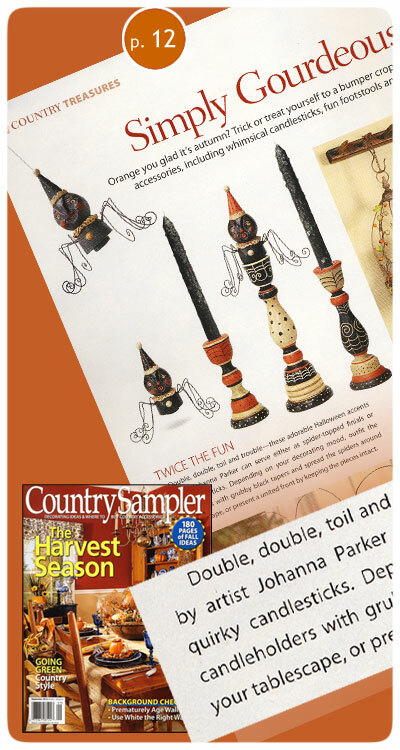 The Country Treasures section on Page 12 begins with a splash of my Candlestick Spiders! What fun it is to see these whimsical characters featured, and I am grateful that Country Sampler acknowledged me as well. 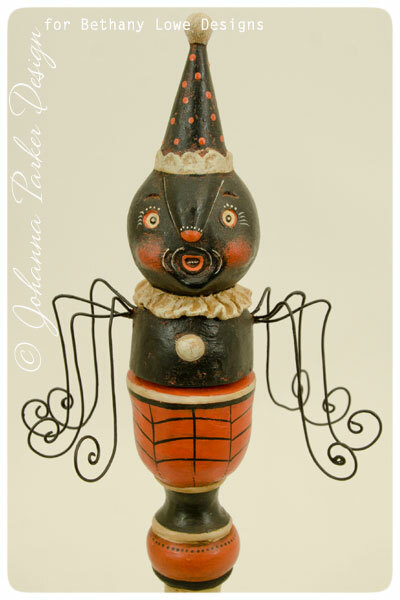 These eight-legged collectibles are practically crawling off the page, and if you would like to adopt a few for your home this Halloween, I would suggest visiting the various vendor sites on my Source Links Page! There are a handful of online stores carrying these curios, and I will also have them available at this year's Halloween Trunk Show. So, go find yourself a copy of this zine in preparation for the harvest season, and many thanks to the folks at Country Sampler for including me once again! "Double, double, toil and trouble - these adorable accents by artist Johanna Parker can serve either as spider-topped finials or quirky candlesticks. Depending on your decorating mood, outfit the candleholders with grubby black tapers and spread the spiders around your tablescape, or present a united front by keeping the pieces intact."